Dice of the First Degree: Guest Batrep 50pts Haley3 (Cygnar) vs. Jarl (Trolls) Arizona Troll returns! Guest Batrep 50pts Haley3 (Cygnar) vs. Jarl (Trolls) Arizona Troll returns! Hello once again! Alan O’Bryan (Arizona_Troll) with another guest battle report on Dice of the First Degree. You can find me on Twitter at @Irish_Al or check out more pictures of my models at www.whpictures.blogspot.com. I hope you enjoy this report! P.S. – The events described in this battle report make some mention of our last match, Siege vs. Grim2. If you missed it, be sure to first read that battle report at http://diceotfirstdegree.blogspot.com/2015/08/guest-batrep-from-arizonatroll-75pts.html. Unfortunately there’s no beer drinking DURING this rematch game (only afterwards) because we were playing at our local game store. Finn entered the tent to find Haley sipping tea and looking over maps of the area. “It has already happened.” She looked up at him. Morrow! She’d been extremely odd ever since regaining consciousness. And growing an arm back. And, well, I guess one might expect her to act odd considering everything she’d been through. Jarl Skuld took a sip from his flask and scratched at the edge of his eyepatch. The damn thing was always painful in the morning. He wasn’t sure why. His stomach grumbled. The army had been moving as fast as possible to reinforce and resupply Grim Angus. Those Mountain Kings were sure good in a fight, but they created all sorts of supply issues. It was difficult to say the least to prevent them from eating everything in sight, including all of the food and ale for the troops and, for that matter, eating the army itself. Wrathar, the eldest brother of the Fell Caller family under his command, pulled him out of his thoughts. “Skuld!” The Trollkin always sounded a bit like he was yelling. “Cygnar troops spotted. And they’re arrayed for battle. Apparently they knew we were coming.” Turgor, Jarl’s trusted Impaler, tightened his grip on his spear, sensing Jarl’s anxiety. He pushed it down, and Turgor relaxed a bit. He was still not used to fighting these straight-up battles and spared a moment to reflect on his days leading small bands on raids through the forest. Jarl drew his pistols and checked that they were loaded and loose in their holsters. He gritted his teeth in determination and began to march forward. Behind him, Runkter, his Mauler, let out a might roar of anticipation. Travis has had a very hard time coming up with an answer to this particular Jarl list in the past. He has been working on this list as a potential counter since Haley3’s rules were first spoiled, but this is our first time testing the match-up after he beat up on our other local players for the last few weeks. Because 1) we’re somewhat lazy and 2) we were testing this matchup more generally and not relative to any specific scenario benefits, we opted to “break the rules” and just play with generic objectives (DEF 5, ARM 18, 15 damage boxes) instead of one of the Steamroller-specific ones. Alan won the roll to choose first player or board edge (4 vs. 3), and elected to take 2nd player and side. It’s probably worth noting here how we set up terrain. We have a chart (1: obstruction, 2: forest, 3: hill, 4: wall, 5: shallow water, 6: no terrain), and we roll a die for each of the six areas of the board (imagine cutting up the board into a 2x3 grid creating six areas). Whatever we roll, we place the appropriate terrain so that it “fits” the board and scenario well. We don’t totally observe the distance restrictions outlined in the Steamroller packet, although we do keep obstructions and walls out of the zones and somewhat apart from flags and objectives. What we like about this is that it creates asymmetrical boards and usually a clearly superior table edge. This makes it a much harder choice to go first or second than with terrain chosen to make the table “balanced” and has also lead to some really interesting battles with terrain combinations we might not have otherwise ever tried. Note that we never allow less than four pieces of terrain, so if we roll too many 6s we reroll them. TURN 1: BATTLE OF THE SMOKE CLOUDS! The Trollkin army had barely begun to assemble when orders went out. “Blazers, move out! Harass their flanks! Trenchers, move up and cover the army! Stormlances, advance. Forgeguard, move up to support the trenchers!” Haley relied on Finn to execute her battle plan. She took a look around her at the men and Dwarfs who would fall today. Such a terrible thing, war. These men must die, but their deaths would save others. The thought brought her no comfort. In fact, she felt very little. This battle had already happened, after all. Haley walked forward, summing her echoes. The army would need them this day. Across the field, an unnatural fog began to rise from the surface of a pond. 1. Tempest Blazers: Run up on the flank. 2. Maxwell Finn: Moves up, gives desperate pace to the Trenchers. 3. Trenchers: Advance a lay down a wall of smoke. Travis left a small gap between two of his clouds (and knew he was doing so). The gap was between the third and fourth cloud. The building at his deployment line interfered with his normal troop placement for this unit. I think he probably could have rotated his clouds and closed the gap. But I don’t know. 4. Stormlances: Move up a bit. 6. Forgeguard: Run forward maintain groups of Dwarfs base to base. 7. Journeyman Warcaster: Casts Arcane Shield on Haley and walks forward. 8. Piper of Ord: Moves up and gives Tough and Fearless to the Forgeguard. 9. Haley: Moves forward and puts both echoes into play. She casts Tactical Supremacy on the Trenchers through the Lancer and casts Temporal Flux. 11. Trenchers Tactical Supremacy: Move back out of the clouds. In his testing, he has found that he likes to have both echoes in play. Future Haley has a great gun that comes in handy when needed plus Revive to bring cavalry back into play, and Past Haley has been his major game-ender, landing multiple assassinations on the feat turn in past games. In addition, he’s hoping that the smoke wall will slow down my Fennblade charge and provide poor targets for Jarl to shoot. The Cygnar army was already in motion as the Trollbloods arrived at the field. “Damn Swans,” Jarl grumbled. He had already begun summoning fog from the nearby pond. Trenchers in the front lines deployed smoke grenades, screening Jarl’s view of the battle. “Well, two can play that game.” Concentrating, Jarl summoned more and more fog, the mist rising from the pond and blowing across the field in the direction of the Cygnaran forces. As the army moved forward, Jarl caught a glimpse of a Trencher moving behind a thin point in the smoke cover. Quickly drawing his right-hand pistol, he fired and caught the Trencher in stomach. The bullet ricocheted into the head of the man next to him. “Ugh. A shot to the gut. That’s a painful way to die, friend. Sorry for that,” he thought. He reached out with his arcane powers to give speed and stamina to the Fennblades on his flank. Nothing to do now but wait for the smoke to clear. 1. Fennblades: Run forward, but not maximum distance. 2. Fennblade Kithkar: Runs forward on the left flank. 3. Fennblade Kithkar(2): Runs forward in the center of the army. 4. Sons of Bragg: Run up behind the Fennblades. 5. Imapler: Advances and forces for 2 Fury to give Far Strike to Jarl. 6. Fell Call: Advances and gives Pathfinder to the Warders. 7. Runebearer: Advances and uses Harmonious Exultation. 8. Jarl Skuld: Advances, casts Magic Bullet for 1 Fury with Harmonious Exultation. He shoots at the Trencher he can just see through the gap in the clouds, boosting to hit (thanks to the proximity of Haley’s unit, he is DEF 15). The shot hits and the Trencher is killed. Magic Bullet kills the Trencher to his right (Jarl’s left). Jarl uses Swift Hunter to move back a bit, then casts Quicken on the Fennblades. Jarl then made the Swans “SMELL MY TROLL FEAT!” by summoning 5 clouds. 9. Warders: Run forward into the pond. 10. Mauler: Riles for 2 Fury, then runs forward. 11. Champions: Run to the right flank next to the edge of the cloud. Having seen him deploy both cavalry on one side of the table, I deployed most of my army diagonally away from them, especially my Fennblades who are very vulnerable to the Blazers and the assaulting, charging, electro-leaping attacks of the Stormlances. My plan was to present my Warders as charge targets for the Stormlances, hopefully not losing too many of them, and to present my Champions as targets for the Blazers. With Jarl supporting whichever unit needed it more, I should be able to handle the cavalry, and my Fennblades and Sons of Bragg should be able to handle the Trenchers and Forgeguard (I hoped). It’s also worth noting that I decided not to dedicate myself to the scenario during the early turns. I had a feeling that he would not commit the entire Haley unit to his flag in order to dominate it (because they would be in a vulnerable position to Jarl’s guns and because he would want them to be spread out to give extra defense to his army with Temporal Flux. So as long as he couldn’t control or dominate my flag I knew I would be okay. Setting up heavily on that side of the table basically guaranteed that wouldn’t be a problem. TURN 2: DON’T FIRE UNTIL YOU SEE THE WHITES OF THEIR EYES! The fog had become so thick and dense, mingling with the Trencher smoke, that Haley couldn’t see anything. Her captains looked to her, confused about what to do with no enemy targets in sight. She relayed orders through Murdoch and Finn to prepare for the Trollbloods’ attack. In the meantime, the Trenchers continued to deploy their smoke cover while the Blazers began to nip at the enemy’s flank. Upkeep Arcane Shield on Haley’s unit from the Journeyman Warcaster. Upkeep Tactical Supremacy for free from Sylas. 1. Tempest Blazers: Move towards the Champions and shoot at the one on the end. Two are in range, and both hit with Brutal Damage. The first shot does no damage, the second shot does 1 damage. They then use their light cavalry move to retreat. 2. Trenchers: Move forward and create a smoke wall. Right after doing this, he realizes that he should have activated Haley first so that he could revive a member of the unit and get an extra cloud. 3. Stormlances: Move forward slightly. 4. Finn: Runs at maximum speed back behind the Cygnar battle line. 5. Forgeguard: Run forward and maintain pockets of base to base groupings. 6. Piper: Gives +1 DEF and Terror to Haley’s unit. 7. Haley: Moves MPV Haley up a little bit, Future Haley moves towards the center of the board, and Past Haley shifts to stand next to the Stormlances. Future Haley Revives one trencher and MPV Haley casts Temporal Flux. The echoes currently sit at DEF 19, ARM 21. 8. He doesn’t really activate and move any of his other models. 9. Trenchers Tactical Supremacy: Move back out of the clouds. He doesn’t have a lot to do this turn because of the feat. He shoots at what he can and sets up to assault me next turn. Jarl ordered the Fennblades to advance through the smoke screen. Not knowing exactly what awaited them, he said a brief prayer to Dhunia to protect them and, if they had to die, to speed their reincarnation. To their credit, the lads surged ahead without fear, chanting their terrifying battle cries. Their Kithkar moved forward, encouraging the unit and keeping an eye out for anything emerging from the smoke. Jarl heard chanting behind him, and turned to see his Runebearer’s eyes glowing with magical energy. Looking in the direction of Skaldi and the Champions, he was about to give them orders to hold the flank, but they were halfway across the field. The Runbearer just shrugged and smiled. “Skaldi, Skaldi,” Jarl chuckled. He must have asked the Runebearer to give them speed. Well, that ‘kin knows how to fight. He should be fine. Runkter the Mauler was straining at his bond, rabid and frenzied to attack. “Whoa, boy. Whoa.” Jarl sent calmness and restraint through the bond. It was like trying to hold back a waterfall, but for the time being the Mauler remained in his control. Jarl upkeeps Quicken on the Fennblades. 2. Fennblades: Use the “No Quarter” mini feat and the front line walks forward 8 inches, engaging both the Trenchers and the Forgeguard. Both pass their morale checks against the Terror (Darn! ), and they kill two Trenchers. The others have moved up a bit. 3. Fennblade Kithkar: Runs forward on the left flank. 4. Fennblade Kithkar(2): Runs forward in the center of the army. 5. Runebearer: Uses Power Glyphs to cast Quicken on the Champions. 6. Champions: Run 12 inches towards the Blazers. One even manages to barely engage the lead Blazer. 7. Sons of Bragg: Move forward behind the Fennblades. 8. Warders: Run forward to form a strong center for my lines. 9. Impaler: Moves forward and is forced for 2 Fury to give Jarl Far Strike. 10. Jarl: Moves forward and shoots the nearest Stormlance. Boosting the attack and damage roll, he kills the cavalryman. He uses Swift Hunter to shift a bit, then fires a boosted attack and damage shot into the next closest Stormlance. The shot does 4 damage, 1 shy of the necessary amount to kill him. 11. Mauler: Riles for 2 Fury and runs forward. I debated using No Quarter this turn. I certainly wasn’t going to use most of the bonuses, but I was pretty sure that I could force two Terror checks. If even one of them failed it would be a huge swing. Alas, both passed. But getting my Fennblades through the smoke screen helped make sure that the smoke was done for the game. Other than that, I positioned myself to minimize the damage he could cause and maximize my counterattack in Round 3. TURN 3: SPEED KILLS, BUT CYGNAR AIN’T AFRAID! Haley watched as her forces absorbed the attacks of the Fennblades emerging through the smoke. The line it would hold. She already knew that their bravery would last. She could hear Murdoch shouting orders to counterattack, and along the line Trollkin were cut down. In an effort to give the Forgeguard a reprieve, she ordered the Trenchers forward into the Trollblood lines. This would buy the retreating army nearby previous minutes to escape. The brave Trenchers did their duty without question, even though they had to know that this would be their end. Haley refused to allow herself to dwell on their fates. There would be time to mourn later. 1. Trenchers: Charge/Assault and kill two Fennblades and leave two others knocked down after they make their tough checks. 2. Haley: Future Haley moves and casts Revive on the Stormlances, bringing one trooper back with 1 unmarked damage box. MPV Haley casts temporal flux and shoots one of the knocked down Fennblades, who survives after making another tough check. 3. Stormlances: Two (the ones with 1 unmarked damage box each) charge the Warders. The other three hang back. Between some missed shots and less than excellent damage rolls, he fails to kill either Warder. One Warder takes 6 damage, the other takes 5 damage. An electro-leap kills the nearest Fennblade. 4. Forgeguard: Dwarfs walk forward and kill two more Fennblades. One more makes two tough checks and survives. 5. Piper: Gives +1 DEF and Terror to Haley’s unit. 6. Finn: Runs into position on the hill. 7. Tempest Blazers: He begins to move the ones not engaged around the edge of the Champions. However, he forgot that Skaldi has Countercharge. When he moves the third Blazer (leaving him in Skaldi’s front arc), Skaldi charges and kills him. Due to the angle, however, he was not engaging the other two nearby so they could still attack. Using Brutal shots, the Blazers pepper the Champions but fail to kill any of them. The Champions have the following numbers of unmarked damage boxes: 7, 1, 7, and 4 (Skaldi). The unengaged Blazers move away with their Light Cavalry move. 8. Trencher Tactical Supremacy: Move forward into my lines and pass the necessary morale check against Terror. Travis starts his turn by saying, "You never leave me any good options, man." As I wrote down this quote, I asked if he meant to call me something more colorful than “man”. He said, “It’s me. So, yeah, that’s implied.” Some friendly ribbing between good buddies. He was really annoyed at forgetting that Skalid has Countercharge, and when I declared the attack he was certain that it cost him that flank. While in a way I agree with him, I’m also not very scared of the Blazers in this list. If they did manage to get through my Champions, Jarl and Magic Bullet could make short work of them. I was pleased at how well the Champions held up against the Blazers. They did the job I needed them to this game and all of them survived. For Travis’s part, he just didn’t kill enough this turn, and the counterattack will be strong and swift. Jarl watched as the Fennblades felled the last of the Trenchers. He turned his attention back to the center of the battle in time to see the Stormlances bearing down on his Warders. Despite the ferocity of the charge, the lads held formation and kept their feat. He took aim and peppered the two lead Stormlances with a hail of bullets until they fell from their saddles. He eased up on the mental restraint he had placed on Runkter the Mauler, and the Mauler’s primal fury emanated from him, empowering the nearby Kithkar. Instinctively knowing what to do, the Kithkar, encouraged by the chants of the nearby Fell Caller, charged the remaining Stormlances. “Warders! With me! Charge!” The Warders followed him into battle, and the Stormlances were cut down trying to turn and retreat. I choose not to upkeep Quicken. 1. Vengeance and Righteous Vengeance: The Fennblades and one Kithkar kill the remaining Trenchers with Vengeance. 2. Champions: Move and kill two Tempest Blazers. They pass their morale check. However, this leaves the Blazer on the far flank out of formation. 3. Fell Caller: Moves up and gives +2 MAT to the Fennblade Kithkar in the middle of the table. 4. Fennblades: Charge and kill 3 Forgeguard. 5. Fennblade Kithkar: Runs up on the left flank behind the Fennblades. 6. Impaler: Moves forward and is forced for 3 Fury to give Far Strike to Jarl. 7. Runebearer: Uses Harmonious Exultation. 8. Jarl Skuld: Casts Magic Bullet for 1 Fury with Harmonious Exultation. He sacrifices his movement to aim, and shoots one Stormlance engaging the Warders. He boosts the damage roll and kills the Stormlance, but the Magic Bullet attack fails to kill the other Stormlance (rolled even to his armor). Takes his second shot at the Stormlance, boosts damage, and kills him. Uses Swift Hunter to adjust his position slightly. 9. Sons of Bragg: Run up next to the flag. 11. Fennblade Kithkar(2): Charges the rearmost Stormlance and, with War Cry and Rage, obliterates the cavalryman. He puts his second attack into the Stormlance on his right but misses. 12. Warders: Receive a Charge! order and kill the remaining Stormlances. This was important because I didn’t want him to be able to revive them on the next turn. It was really important to me that I finished off the Stormlances. If I failed to kill all of them, then he can start to use sneaky Revive tricks to bring them back in inconvenient places, bypassing my defenses and getting deep into my lines. So I moved to hold ground on the left flank and focused all of my resources towards getting rid of them. Haley ordered her young echo through the lines to distract the Trollkin warlock and his troops while her older echo bolstered the Dwarf lines. Haley herself took a shot at a Warder knowing exactly where to place the bullet to maximize the damage. In the distance the Blazers struggled with Trollkin Champions while close by the Forgeguard held fast against the dwindling Fennblades, causing massive casualties on that flank. “It is almost time,” she said to no one in particular. The Journeyman Warcaster upkeeps Arcane Shield on Haley’s unit. Haley maintains both echoes and camps the rest of her Focus. 1. Finn: Moves up and rolls 3 shots. His first shot at the Kithkar on the flank misses, but the second shot hit and rolls box cars for damage. The Kithkar makes his tough check, but Finn’s third shot finishes him off. 2. Haley: MPV casts Temporal Flux. Past Haley moves up through the Trollbloods lines and casts force hammer at Rhudd of the Sons of Bragg. The spell lands, and he is slammed back into Tor. Both are knocked down, Rhudd takes 6 damage and Tor takes 5 damage. Future Haley revives one Dwarf in a position that will allow him to get to the Sons of Bragg. MPV Haley shoots and kills the Kithkar near the Warders after boosting damage. 4. Journeyman Warcaster: Stands still to shoot at the Warder nearest the flag. He rolls snake eyes and misses. 6. Forgeguard: Walk forward and kill most of the remaining Fennblades, who pass their morale check by rolling an 8. One Dwarf walks up to Tor and kills him, but the Son of Bragg passes his Tough check. 7. Tempest Blazers: He moves the Blazer who was out of formation into formation, and the other one shoots at Skaldi and does 3 damage. Skaldi has one unmarked damage box remaining. At the beginning of his turn, Travis said, "Can I even salvage this? I don't think so.” The tide was definitely turning against him, and he had no choice but to try to put Past Haley into a position to kill me next round if I missed her with the shots from Jarl. I had too large of a manpower advantage at this point and he didn’t have much left that could kill my high armor troops. Will Past Haley survive a round of shooting from Jarl…? This was it. The pivotal moment of the battle. Having seen that young woman run THROUGH his troops to knock Rhudd and Tor to the ground with a magical explosion of energy, Jarl didn’t hesitate to put a bullet in her. Willing the Sons to be okay, he sent mental images through his bond with the Impaler. The Impaler ran over and speared the Dwarf just before he could strike Tor for a second time. With a mighty shout from Wrathar, Tor and Rhudd stood up and all three Sons began to sing one of their ferocious songs as they charged towards the remaining Forgeguard. Jarl takes all of the Fury from the Impaler and 1 Fury from the Mauler. The Mauler passes his Threshold check. 1. Vengeance: Vengeance kills one Dwarf and the Drummer moves up. 2. Fell Caller: Moves to his right, gives +2 MAT to the Warders. He then sprays the center Dwarf in the line of three Forgeguard towards the middle of the table and catches all of them. With the armor bonus and the defense bonus from Temporal Flux, all three attacks either miss or fail to break armor. 3. Impaler: Moves up behind the Sons of Bragg and, boosting to hit, kills the Dwarf in front of them. 4. Champions: Skaldi kills both remaining Tempest Blazers, and the other Champions move to the inside edge of the hill. 6. Jarl: Sacrificing movement to aim, he boosts an attack and damage roll into Past Haley and kills her. 7. Fennblades: The one knocked down sacrifices movement to stand up. They failed to kill any Dwarfs, but that’s okay because they just needed to clear a path for the Sons of Bragg. 8. Sons of Bragg: Use their Fell Call to stand up without penalty, then charge the Dwarfs. The assault spray misses both the Dwarf and MPV Haley, but the charge attacks kill four Dwarfs. At this point things were looking very good for me. My Fell Caller could get to the flag next turn and start controlling it, and I could move my Champions and Mauler towards Haley without any way for him to deal with them. Haley would be dead pretty soon or I would start getting an unstoppable edge on CPs. CYGNAR CONCEDES: VICTORY FOR THE TROLLBLOODS! With her past echo removed, Haley sounded the signal for retreat. Travis conceded the game at this point for four reasons. 1) Things were looking very bad. I was about to start scoring CPs without any way for him to stop me. 2) He mostly wanted to see if this list was an answer for Jarl. Clearly it wasn’t, at least not in this game, and he had seen all he needed to see. 3) It was 9:30 p.m. and the store closed at 10:00 p.m. and we needed to pack up soon anyway. 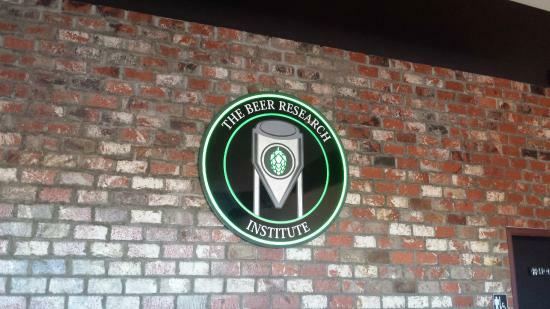 4) We have a ritual of heading to our favorite local watering hole (http://www.thebeerresearchinstitute.com/) after our Thursday night game nights, and some of our friends were done with their game and ready to head over soon. So we shook hands. Another victory for both of us, actually, because the most important thing is to have a good time with good friends. And in that regard, we both succeeded! 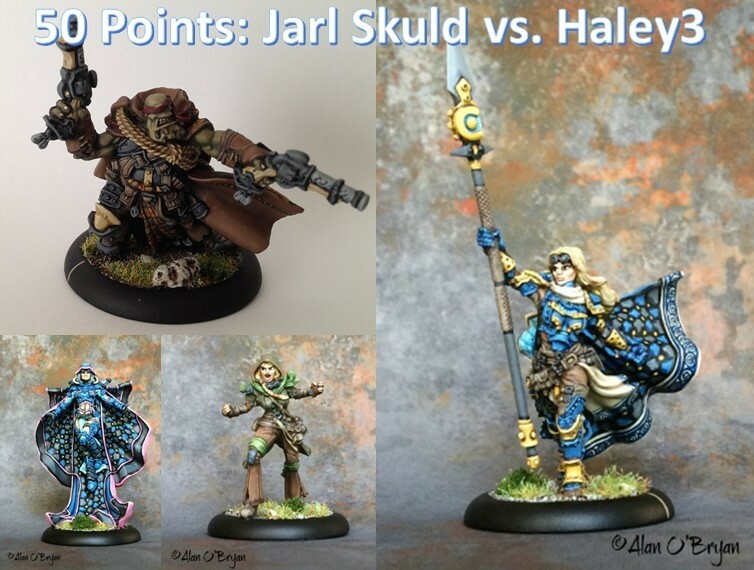 1) I don’t think Haley3 is the answer to Jarl, even though Travis really, really loves her (she has become hands down his favorite Warcaster to play). Travis really thought that high armor and defense (plus clouds) would make the echoes safe from Jarl, who was the only model with magical attacks. While in a way that part was true, he never really forced me to have to deal with them when they had all of their buffs stacked together. When he finally moved Past Haley up to threaten Jarl, he chose to try to remove the Sons of Bragg with her spells. But this reduced her armor when Jarl retaliated. It turned out that I rolled something stupid for damage (like a 15 on three dice), so she would have died anyway, but he certainly didn’t maximize his chances that she would survive to try to kill him the following turn. 2) It’s the little things that get you… Travis forgot that Skaldi has Countercharge, and as soon as I declared the attack he realized that it likely won me that flank. While it’s impossible to remember every rule in a game with this amount of depth and complexity, forgetting an important ability like Countercharge can really cost you. 3) Pay attention during your opponent’s turn. So, to be fair, I was taking notes as fast as I could type on my phone, so I had a bit of an excuse to lose track of a model here and there. But I didn’t notice what he did with Finn on Turn 3, and that lost me my Fennblade Kithkar on the left flank. 4) Holy crap, Temporal Flux is an amazing spell when you can spread it out that far with three members of the unit. 5) I love Jarl so much. He is far and away my favorite Trollblood Warlock, and I’ve gotten very good at playing him. So much so that I’ve mostly retired him from play with our local group. So getting an opportunity to get him back on the table was a lot of fun for me.